Directions For truly natural-looking results, choose a shade that is within 1-2 shades of your current color. On Salt/Pepper Gray: Gray hair will appear lighter than non-gray for a highlighted effect. On White/Gray: You will get a medium cool brown result. On Natural Red: You will get a medium cool brown result with fewer red tones. Warm Shades such as Golden, Caramel, Spice and Bronze add golden tones. Consider Auburn and Red shades to add warm reddish tones. Neutral Shades provide soft beige tones and neutral highlights. These shades are ideal for gray coverage. Look for neutral shades with Champagne and Neutral tones. Cool Shades reduce red and gold tones and add cool highlights. Look for cool shades with Ash tones. Cool/Neutral: Natural Medium Cool Brown 117D. Uses Salon experts know it takes a perfect blend of tones to create amazingly natural color results. Nice 'n Easy creates beautifully blended, natural-looking shades for you, just like the experts, in one easy step! Q. 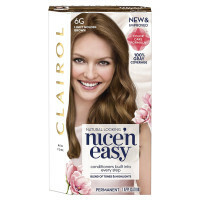 How do I know if Nice 'n Easy is right for me? A. 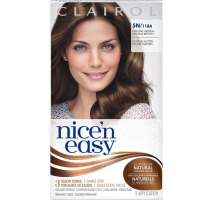 Nice 'n Easy gives you ultimate natural-looking color with highlights and shine in just one easy step. Browns are brilliant, blondes are illuminating, and reds are radiant. Q. How does it work? A. 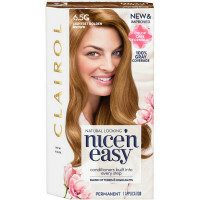 Only Nice 'n Easy has our exclusive Color-blend technology. In one easy step, each shade gives you an expert blend of 3 tones that work together to create natural-looking color with shining dimension. Q. Will it cover my grays? A. Yes! Nice 'n Easy promises 100% gray coverage, even on resistant grays. Q. How long will it last? A. Nice 'n Easy lasts for up to 8 weeks. And for your brilliant brown shade, you'll find 6 weekly treatments of our exclusive ColorSeal Conditioning Gloss to seal in healthy-looking color and add intense shine.